Local businesses, like national businesses, have a bipolar relationship with coupons. They love them for bringing new business, and hate them for bringing bad business. Coupons and similar discounts don’t always pay out. But planned thoughtfully, they can indeed drive higher sales and profits. Addiction. Coupons should be an occasional tactic, not the entire marketing plan. By only incenting prospects, not impressing them, owners can harm their reputations. Dizziness. After accounting for the time spent creating, printing, distributing, discounting, potential confusion at the registers, etc, restaurants may have surprisingly expensive promotions. Desperation. Businesses may inadvertently teach customers their product is not worth the price. In fact, they may suggest they are overpriced. Chilling effect. If an owner utilizes coupons too frequently, she may train the customers who found her through coupons to simply wait for the next one. Favoritism. If managers aren’t watchful, wait staff will keep copies of coupons to offer their own customers or friends. Discrimination. If the regulars who have consistently dined at full price find out someone who’s never been there is getting a better deal, they just might not return. Increment. Setting offers with COGS (cost of goods sold) and ACS (average customer spend) in mind protects profits. Setting the value of the offer below the ACS gets patrons to spend more. Requiring a minimum spend ($20 off $50) further protects margins. Timing. 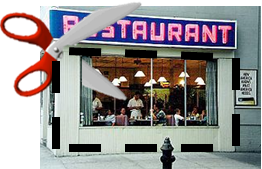 Restaurants are fixed cost businesses. Down time can be costly. What started with Happy Hours is now a mobile-enabled concept that can be activated during any slow time. Businesses like Think Near and others have developed impulse coupon programs triggered in advance or real-time. Products. Giving discounts on higher margin products like beverages — especially beer, wine or spirits that would not have otherwise been purchased — creates perceived value without causing losses. Requirements. Getting customers to buy a package they wouldn’t normally buy actually creates funds for discounting. A “2-for-1 appetizer with the purchase of an entree” is one example. Requiring gratuity serves wait staff. Situations. Grand openings require special means to attract customers. All customers are new. Businesses start from a baseline of zero and will stay there without incentives. New openings or relocations are similar. Loyalty. Reward those who buy regularly, every day, 365 days a year. There’s more business to be had from them. For years the doctrine of caveat emptor cautioned consumers against impulse purchases that can’t be reversed. More than ever, the concept of caveat venditor should warn small businesses against poorly planned coupons–they too are irreversible. Coupons are a great way to spur trial. The mistake small businesses make is giving coupons to patrons who will never return. In doing so owners lose money and tick off regulars. A simple loyalty program takes care of this problem. Business owners have lots of marketing vehicles to use and should not be wedded to just one. Excellent post! I actually hate coupons as I feel stupid to waste time collecting them and then again for paying more as I do not use them. Shopper Marketing Magazine dedicated an interesting article in its June issue to extreme coupon collectors and the adverse effects. Harvard Business Review also took a critical position. In the end, they exist for some reason but they are a costly way to make potential customers try a product. Johannes–There is indeed a risk of adverse effects by extreme couponers. Like bad debt and returns, gaming can be tolerated if the program as a whole is ROI positive. Ways to limit abuse included digitally limiting the number of redemptions by any individual.